PLAYING the bad guy has never worried Manu Bennett. The New Zealand-born, Australian raised actor enjoys playing two deliciously deviant characters at the moment: Arrow's anti-hero Slade Wilson (aka Deathstroke) and the terrifying Orc leader Azog the Defiler in The Hobbit film trilogy. 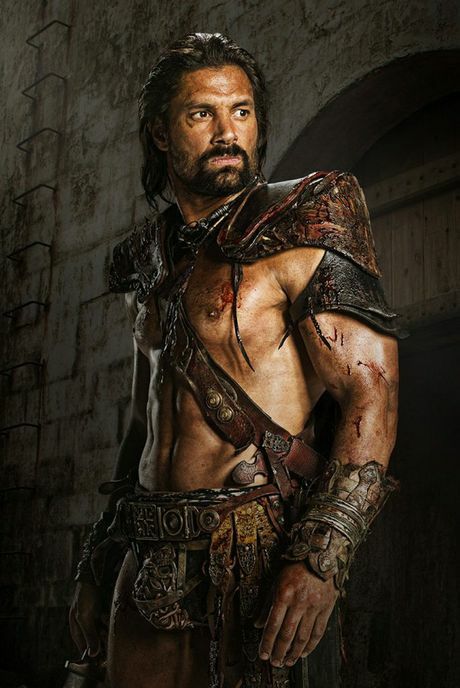 He also played Spartacus's nemesis Crixus in the hit gladiator drama Spartacus: War of the Damned, which is currently enjoying a wider release in the US on the basic-cable channel Syfy after originally airing on Starz (pay-per-view). "To be these explosive, powerful characters is really interesting," Bennett told APN. "I went to a boarding school in New Zealand and I was bullied by a former All Black, Norm Hewitt. The bullying that he gave me is something that I've used in both Crixus intimidating Spartacus and Azog being this giant menace, who has no opposition in terms of his size and intimidation. "This adverse thing that happened in my youth has ended up being something that's given me power and helped me as an artist." But importantly, the father-of-three was able to forgive his schoolyard bully when the pair unexpectedly met a few months ago. "Maybe four months ago, I landed in Wellington Airport and I get a tap on the shoulder and it's Norm Hewitt," he said. "It was the first time I'd seen him since high school and the next minute we're getting together with our kids. He apologised and gave me two of his All Blacks jerseys. "It inspires you to be part of stories that can tell that same sort of analogy of resolution." Bennett found himself on a United Service Organisations (USO) tour of Kuwait after he discovered how many soldiers were fans of Spartacus. "I have Marines from the US Army, (the) first people to land in Iraq and lost friends in the battles, I had them coming up and embracing me, and saying that our show was one of the few things they could relate to. "It was crazy how something can have an effect on a particular group of people like the military, but of course it did. It was about a band of brothers in a gladiatorial setting, with people dying left, right and centre. "You know it resonates in these areas, but you don't think about it until you come face- to-face with these people." It doesn't look like his Arrow character Slade will be patching things up with Oliver Queen anytime soon. The 45-year-old was in the country last week for the Supanova Pop Culture Expo and met plenty of young Arrow fans. "I was doing an interview and a journalist showed me a photo of her 12-year-old son with a Slade T-shirt on," he said. "To him I'm just this American actor... but for this generation now with my work this is what they see me as. "There are some very touching moments that are shared amongst this audience who have seen this 2D image of a show on television… the fans are so generous." Season three of Arrow returns next year on Channel 9/WIN.